¡Hola! Two posts in one week! I've been dying to post these photos ever since we took them, which was almost a month ago! These were taken during a weekend getaway to the west side of Puerto Rico. We were staying at Cabo Rojo and took a road trip to Aguadilla to find this beautiful beach appropriately named Survival Beach. The hike to the beach was definitely a challenge but also worth it! It lead us to a long, beautifully seemingly untouched beach through a path filled with gorgeous views. There are also breathtaking caves along the way but the tide was too high for us to explore them. The hike is not one for the weak or light-winded, let me tell you! We had no idea that the path was going to be so intense so you can imagine me hiking along in lace-up sandals, this gorgeous maxi dress and almost every beach "necessity" you can imagine... Beach rookie of the year! I had bought this dress over a year ago for my honeymoon but never used it. I love the front slit it has and the off the shoulder sleeves. It's very, very transparent so I wouldn't use it for anything other than a swimsuit coverup. I paired it with some lace-up sandals (not pictured) and this amazing sun hat I found at my local Marshalls. 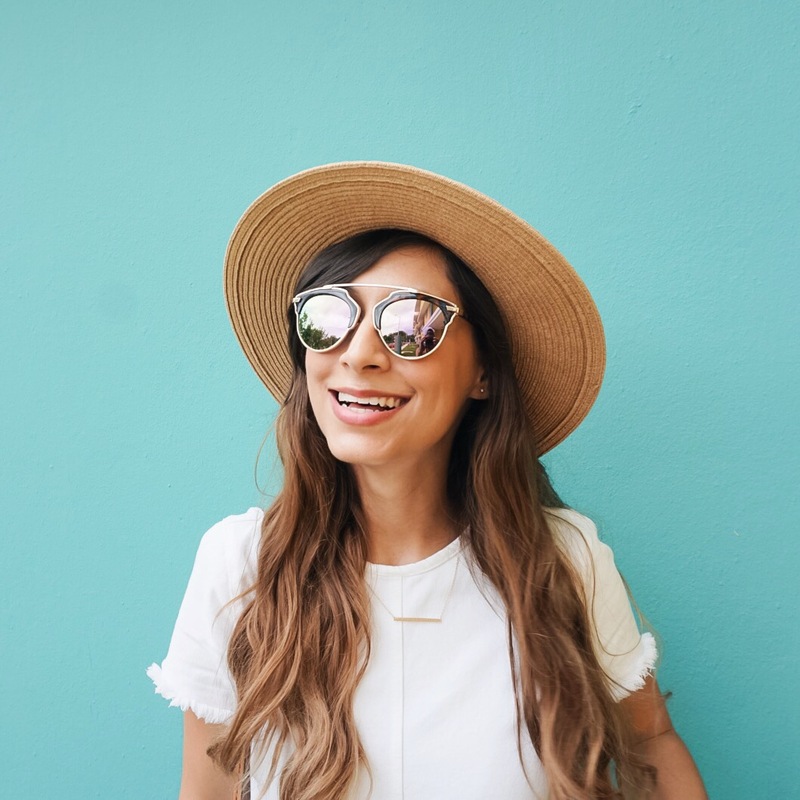 Similar hats have been featured on almost every fashion blogger I follow's Instagram but those were super expensive (like this one, $400 for a hat? NO.). So you can imagine the squeal I let out when I found this one for only $14.99! Jackpot! Topped everything off with my round Ray-Bans and boom! Beach chic at a very affordable price! 1. Wear comfortable shoes! Use tennis shoes for the hike and bring some flip flops in your beach bag if you want to. 2. The path can be very narrow at times so think about what you're taking carefully. For instance, a huge cooler on wheels would not be a good idea but a small one you can carry cross-body or on your shoulder can work. 3. There are spots under cliffs and huge rocks to hide from the sun but I recommend bringing a beach umbrella just in case all those spots are taken. There is no shade close to the shore. 4. Pack light! Do you really need 3 sunblocks, 4 chairs, 2 meals and 6 snacks, etc.? No. Cut it down to the bare necessities. Obviously, your favorite drink (and water) has top priority! I took a bottle of champagne (a cheap on!) and a small, travel juice for mixing my own mimosas! 5. Bring a trash bag so you can leave the beach nice and clean! Depending on where you're leaving from it may differ but you must end up on Carretera Puerto Rico 2/PR-2 W to Aguadilla. Then take PR-107 to Cliff Rd in Maleza Baja until you arrive to a parking area. From there, walk to the beginning of the parking lot, towards the forrest, and start the hike following the path on the ground, follow it straight. There are no signs so don't be afraid to ask someone for more specific directions! The hike will take you 20-45 minutes depending on your speed and cargo. Here's a pin for further direction: https://goo.gl/maps/J6PgeELtdWz. If you visit, let me know with the hashtag #thegirlonanislandtravels! El tan esperado post! Love it! Made me laugh and the pictures are just gorgeous. Que bueno que te ries de mis ocurrencias! haha Gracias por disfrutarlo, bunny!